I hope you are all having a fabulous weekend. Today I write to you about a topic that is vexing to many in the CrossFit world. I'd like to shed some light on the purpose and applicability of "RX" for workouts. I can't promise to answer all your questions or perfectly illuminate the flow diagram of who should and who shouldn't in a given scenario, because quite honestly, there are just too many variables that come into play. Still, it is an important part of how we measure progress so it is worth examining. The "RX" for a workout is the load or rep scheme or movement that is "prescribed" for that workout by the person designing the workout. It is just a guideline, not a requirement, and we can use it to determine the intent of a workout or how it is supposed to feel. It is essentially the gold standard by which all other efforts of that workout are compared. It is extremely important to note that we are not looking for similar numbers on all peoples barbells or equal number of bands on pull ups, but we are looking for equal effort and struggle across all pieces of the workout. We achieve that equal struggle by using scaling and modifications to get everyone moving away from- or closer to- the intended stimulus of the workout so that we all get the same thing out of it. Inherent in an RX designation on the Catacombs whiteboard is the understanding that all reps must be performed to full and complete range of motion with 100% integrity in movement. Missing reps or losing count or shorting range of motion are all reasons to withhold an RX designation...even if you used the prescribed load or performed the movements that were written on the board. For example, push ups that didn't meet the standard of a plank position throughout or pull ups that leave doubt as to whether or not the chin was completely over the bar dictate that a workout cannot be marked as "RX". As a point of pride and integrity, never give yourself the benefit of the doubt that your movement was "close enough" or "mostly there". Maybe you know you did 44 of 45 excellent pull ups in Fran, but number 16 was kind of short. Awesome. Go ahead and do one more excellent pull up before you call time. But if you know you stopped your workout and you didn't correct that one rep, you cannot, with your pride and integrity intact, put RX next to your name. We get this question a lot and the answer depends on a lot of variables. Typically, the loads, reps and movements that are "prescribed" may only be appropriate for a small segment of the gym population...and it won't be the same population each day. Often workouts are designed with experienced and competitive CrossFit athletes in mind. Our gym is not made up of competitive CrossFitters, but rather parents, teachers, runners, bikers, doctors, nurses, and business people. 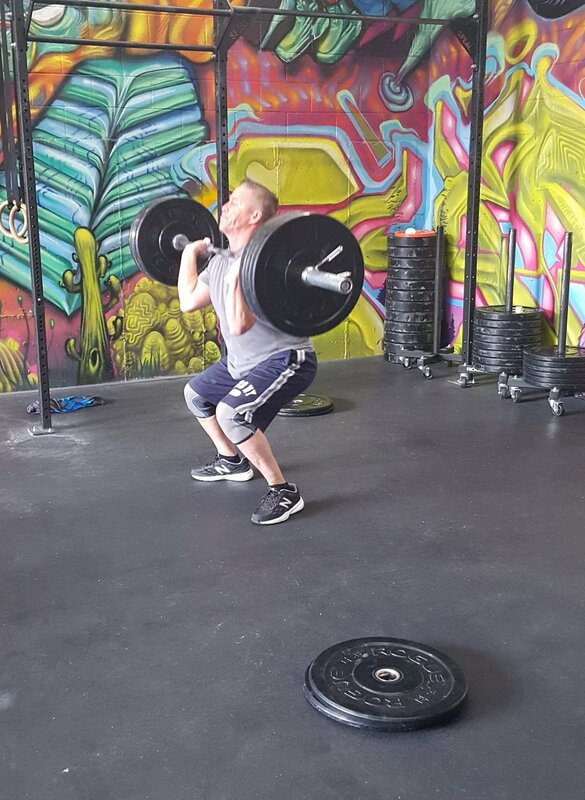 Often workouts are designed with experienced and competitive CrossFit athletes in mind. So if you are new, dealing with an injury or have things to worry about besides your CrossFit workout, you might be better served by scaling in collaboration with your coach. And even if you typically don't RX workouts, every now and then one will come up that has all your strong suits in just the right mix. When that happens, you should totally step up to the plate and give it a shot...even if you are the last one finished. Are you a better athlete or human if you complete a workout "as prescribed"? Duh. Of course not. It doesn't matter. My personal experience is that often I get a better workout by lowering the load a little bit or modifying a movement that is going to slow me down. I work hard to match the intent without letting my ego weigh in. I didn't always feel this way, but I've got a few more years on me than when I first started. My body and my priorities have changed. When the right mix comes up and all the lights are green, I go for it. When my sleep or nutrition are a little off or I'm feeling beaten down, I go for the moral victory of working out in spite of how I feel but being smart about scaling. Knowing the parameters for the RX version of the workout gives you important information about the stimulus and intent of the workout. I can gauge where I should be with loads or reps by understanding what the RX parameters mean. We try to communicate these parameters every workout. If it is a load that I know I CAN do but I will do them in sets of 2 or 3 when the stimulus calls for 10 in a row, I take some weight off. This is never an easy call especially as someone who has historically done many workouts as prescribed, but that is where ego becomes the enemy. Ego says "you have definitely lifted 300 pounds in a deadlift exactly one time, so why not try to do 285 pounds 45 times?" Ego says "my shoulder hurts a little, but I know I can do pull ups without a band, so no band for me today." Ego says "I haven't been very consistent in the gym lately and I need to make up for it so I'm just going to suffer through no matter how long it takes." And we get away with it for awhile. Until, one day that little tweak turns into a nagging pain. Then that nagging pain turns into legitimate injury. The next thing I know, I'm on the sidelines...which is devastating when my real goals are around consistency. So scale some this week if you don't normally. Try out a different mod with the help of your coach. See if you still don't get an awesome workout completed and feel completely satisfied with your exhaustion level. I guarantee you will still be sweaty, still be tired, still be happy with your work. And all the people around you will be just as proud of you, just as impressed with your effort, and extra happy with your integrity of not writing RX on the board if it doesn't truly apply.